Euclid Avenue is the City's most vital link to its past. The 200 foot wide historic route with its landscaped median was an integral part of the founding fathers' design of "The Model Colony." 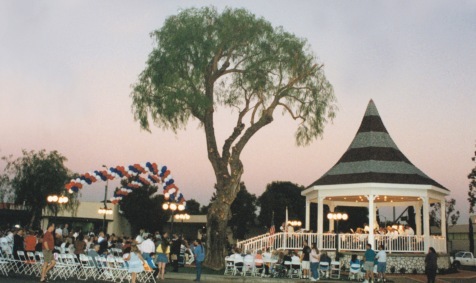 In downtown, the median is used for special community events. Ontario is poised to experience extraordinary growth. Achieving this growth in a manner that is consistent with our Vision requires a delicate balancing act. For instance, the City must balance the benefits and impacts of being a regional urban hub with the livability of our neighborhoods. As an active participant in regional planning and SCAG’s Compass Blueprint, Ontario contributes to the regional jobs-housing balance by providing significant office, industrial and retail employment opportunities while focusing this growth strategically to minimize development impacts on established neighborhoods. A community that has a spectrum of housing types and price ranges that match the jobs in the City and that make it possible for people to live and work in Ontario and maintain a quality of life. Strategic Growth. We concentrate growth in strategic locations that help create place and identity, maximize available and planned infrastructure, and foster the development of transit. Sustainable Community Strategy. We integrate state, regional and local Sustainable Community/Smart Growth principles into the development and entitlement process. Adequate Capacity. We require adequate infrastructure and services for all development.